Buying a cheap car subwoofer can feel like a gamble. You might get lucky and find a machine with good performance that doesn’t distort at high volume levels and hurt your ears… or you might get saddled with a cheap piece of crap that doesn’t make any noticeable difference. Yes, you get what you pay for. That doesn’t mean you have to settle for crap if you’re on a tight-budget. Truthfully, you’re not going to find quality competition subwoofers for under $200, but on our list you will find plenty of perfectly capable budget car subwoofers with good performances. There are great car subwoofers in the sub-$200 price range that offer good value for your money and perform relatively well for most casual needs for bass. But which ones? We know that shopping for budget car subwoofers can be frustrating. But finding the best deal makes everything – all the hours of research and comparative shopping – well worth it. To help you make an informed buying decision, we went ahead and compiled a list of the best cheap car subwoofer in the market. No matter your budget, you’ll find something to suit your needs here. But, because everyone has a different idea of what the ideal car subwoofer looks like, we’ve listed some small subs, some large subs and everything in between. You’ll never be able to find the perfect budget car subwoofer; if it had the perfect specs, it wouldn’t be cheap. But there are a few minimum requirements you absolutely should not compromise on when buying one. Undoubtedly, a powered car subwoofer will save you from the hassle of matching up a sub with a compatible amp and enclosure, but which one to choose? Rockford Fosgate P300-10 is one of the best powered car subwoofers under $200. It’s featured with a “Punch” 10 inch subwoofer in a custom sealed enclosure and is powered by a relatively powerful 300 Watt amplifier. This all-in-one bass system could be a great match if you’re wanting to to quickly add bass to your sound system, no muss, no fuss. That said, you only need to run power, ground and a signal from the source to get this baby moving. The sealed enclosure provides great sound quality. The rugged industrial vinyl coating that it’s covered with resists scrapes and bumps wherever you choose to install it. This powered car subwoofer features variable low-pass crossover (50-120 Hz), bass boost control (0dB to +6dB), phase-cancelling switch, as well as High- and low-level inputs so you can connect it to any system. It also comes with a handy wired remote bass control for adjusting bass levels on the fly. If you’re looking for a reasonably priced, compact powered subwoofer that doesn’t take a lot of space, we can’t think of a better option than Rockford Fosgate P300-10. It’s definitely not a pro or show competition solution, but this bass system would be more than enough for most casual bassheads. All in all, Rockford Fosgate P300-10 is a very nice package with solid, concise and crisp bass that you can feel in your car. It’s very easy to install and set up, and it’s also quite easy to disconnect it when you need the extra space in your trunk. Rockford Fosgate is usually the best choice when it comes to cheap car subwoofers. They offer a wide range of budget-friendly car subwoofers. P3D4-12 Punch P3 offers quite a bit of bang for your buck. It’s one the best car subwoofers under $200, all things considered. Rockford Fosgate P3D4-12 is a great daily driver. It packs a hell of a punch and can handle a decent amount of power. So, unless you plan on going into competition, this sub should be more than enough for most casual bassheads. It’s rated for 85 dB sensitivity rating and can handle up to 600 watts of power on continuous basis. And as far as frequency range is concerned, this sub can hit as low as a claimed 28Hz and as far up as 250Hz. This sub features a rigid anodized aluminum cone that holds its shape through heavy play, while staying light and responsive. It’s supported with Santoprene surround for maximum stability and long lasting performance. This Punch P3 12 inch subwoofer uses VAST technology to increase surface cone area by up to 25%, so that the cone can move more air for deep bass. To prevent sound distortion and sub’s bottoming out, this aluminum cone acts as a giant heat sink, dissipating the generated heat away from the copper-clad aluminum voice coils, while the special venting keeps the voice coils well-ventilated, so you get incredibly consistent bass performance over time. Rockford Fosgate car subwoofers are built on a long-standing experience and in-depth loudspeaker expertise which allow for impressive performance. Skar Audio is a newly established brand. They were founded in 2012. However, despite being new to the industry, Skar Audio has smoked the competition in the speaker, subwoofer and amplifier categories winning high praise from customers in all sound quality, build quality and price categories. 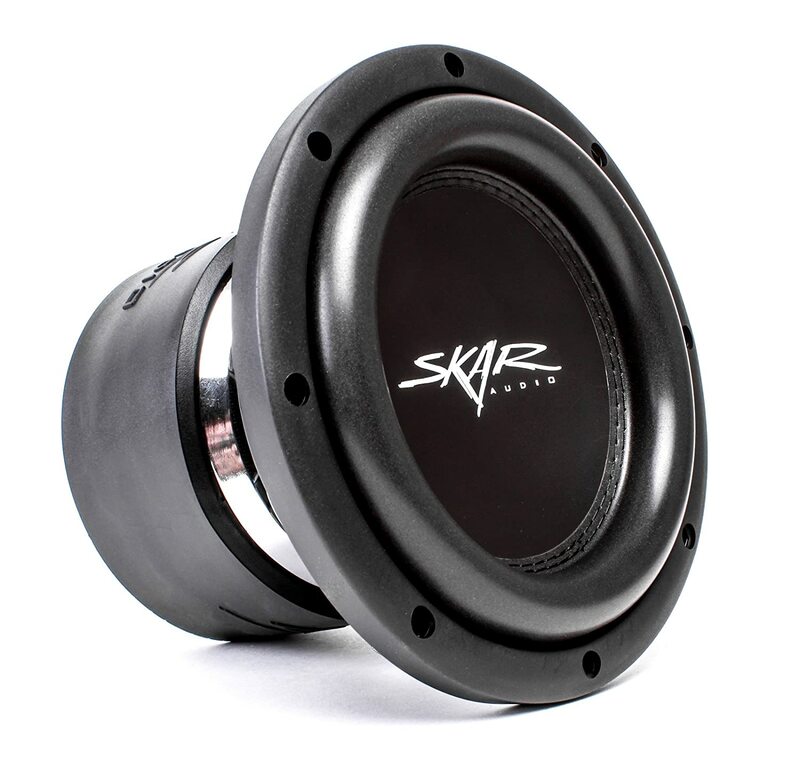 Skar Audio offers some of the best cheap car subwoofers in the market. However, they don’t forfeit quality for low prices. The VVX-8v3 D4 is one of the best budget-friendly 8 inch car subwoofers under $100 that Skar Audio has to offer. It’s designed to be a high performance, competition grade subwoofer that can take serious amounts of power thanks to its competition grade paper cone, which, when combined with a high temperature 2-inch copper voice coil, an advanced cooling design, and the sub’s new custom tooled basket allow for exceptional performance. Speaking of which, this little beast can handle up to 400 watts of power RMS. It can hit as low as a claimed 55Hz and as far up as 500Hz. Skar Audio VVX-8v3 D4 is a great, budget-friendly 8 inch subwoofer that truly make a night and day difference. If properly powered, this sub sound quite loud and deliver deep, pounding bass. Looking for a cheap shallow mount subwoofer? Well, Pioneer sealed enclosure with low profile 10″ subwoofer is a great option to consider. It’s one of the most budget-friendly enclosures out there. This enclosure is designed to deliver great performance without taking up a lot of space. It can fit in a wide variety of car trunks and truck applications. At only 6″ deep, It’ll work in most standard, extended, or crew cab pickups. The enclosure at hand is made of 5/8″ medium density fiberboard and it’s covered with black carpet that will blend well with any car interior. It houses one Pioneer’s TS-SW2502S4 shallow mount 10″ subwoofer, which features an oversized cone structure that provides greater cone and gasket surface without changing its standard external dimension. This 10″ sub feature an oversized, mica-injected molded resin cone that rigid and responsive. It can move more air for louder deeper bass. Additionally, Its dual-spider design provides more cone motion control and stabilization. It also supports the subwoofer’s linear movement for accurate bass response. The TS-SWX2502 is also featured with angled push terminals which prevent bending of connection wires, thereby reducing stress on the wires, saving space and making installation a lot more easier. Pioneer TS-SWX2502 is rated for 89 dB sensitivity rating and can handle up to 300 watts of power on continuous basis. It can hit as low as a claimed 20Hz and as far up as 200Hz. For a shallow 10″ inch in a sealed enclosure this thing hits pretty hard. It’s not meant to compete with the bassheads that like to be heard miles away, but it does sound excellent and will make your music sound perfect with refined, loud bass. Here’s another top-rated cheap car subwoofer from Rockville, which is a brand we haven’t come cross very much on our site. However, this Rockville subwoofer stood out as one of the top rated, yet reasonably priced car powered subwoofers in the market. At only 2.7″ thick, this sub will easily fit under your seat. This slim bass system is fitted with 10 inch subwoofer and it’s powered by a built-in amplifier. It features variable high- and low-pass filters (50-250 Hz, 12 dB/octave), low level RCA input and high level inputs with auto turn-On technology, adjustable bass boost (0-18 dB boost @ 45 Hz), as well as thermal and overload protection. The RW10CA features a sensitivity rating of 90dB and can handle up to 200 watts RMS. It can hit as low as 20Hz and as far up as 150Hz. That said, you won’t shake mirrors and license plates with this setup. However, as a complement to your car speakers, or just as filler bass, this is a great product, and it does surprisingly kick hard for such a shallow mount sub, but not as good as large component subwoofers.